This was a two-stage competition. The first stage was an international search for multi-disciplinary design teams, based on relevant skills, past experience and an understanding of the project brief. It culminated in the selection of seven teams for the shortlist, who were given further briefing and asked to produce concept designs. As part of a wide-ranging consultation process, the Ross Development Trust held a public exhibition of the designs at Edinburgh’s City Art Centre from 21 June until 30 July 2017, where the public was asked to give their views. At the competition’s first stage, the Trust sought creative teams led by an architect and demonstrating expertise in landscape, engineering, heritage and planning – and any other additional skills considered necessary. For shortlisted competitors at stage two, the essential design challenge was the replacement of the existing Bandstand with a new Pavilion of exemplary design quality inspired by, and appropriate to, the significance of its setting. The brief called for an original design of international quality and significance, creating an image that will, over time, come to be associated with Edinburgh. The Ross Pavilion and Gardens project should be considered within the context of an integrated landscape masterplan for West Princes Street Gardens, the aim being to reimagine and reanimate one of the most important civic spaces in the city, whilst considering its connections to the wider city area. The new Pavilion must be compatible with the different existing and potential botanical, civic, cultural and commemorative uses of West Princes Street Gardens, which include a tranquil respite from the surrounding urban area; a daily venue for small-scale indoor and outdoor events; and a space for occasional large-scale outdoor events attracting up to 8000 people (3000 seated, 2000 standing and 3000 elsewhere in the Gardens). A visitor centre, including a viewing platform; café with indoor and outdoor seating; and flexible spaces and support facilities for a range of uses including small-scale performances, community meetings, events and workshops – transformable into hospitality suites for large events. The visitor centre should provide a new, step-free gateway to the Gardens from Princes Street. A performance space, including a sheltered stage for large headline events which is capable of transforming into an enclosed performance and audience space for smaller, more regular shows. Backstage facilities should include a performance dressing room with associated locker, changing, and washroom facilities. 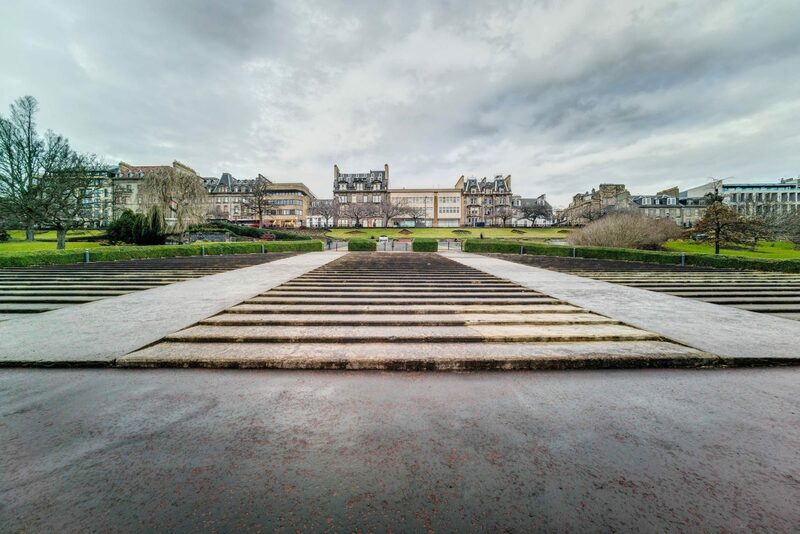 A natural amphitheatre created by returning the hard-surfaced seating bowl to a softer landscaped finish, restoring more of West Princes Street Gardens to green space. The seating area should be capable of accommodating up to 3000 people seated for large-scale events (with many more standing throughout the Gardens), but also being used for more intimate outdoor events of between 200 and 1000 people. A landscape masterplan of West Princes Street Gardens including landscaping improvements, access, way-finding and lighting. The landscape interventions should improve connections through the Gardens between the Old Town and the New Town, as well as restore the promenade condition of the border between Princes Street and West Princes Street Gardens. Within the landscape masterplan are two areas of specific design consideration: the blaes area which is currently used for a number of purposes including external catering, event set-up and public amenities; and the listed 1950s shelter buildings. At the second stage the competition asked for design proposals from shortlisted teams that showed an understanding of Edinburgh’s dynamic and creative twenty-first century identity – whilst respecting and enhancing its historical setting and traditional values. Budget and programme: The total project value is estimated to be £25 million and project completion is expected by December 2019. To find out more, download the Search Statement, which was issued at the outset of the competition.